Each of the five characters on the camping trip has a distinctive personality: nervous Timo, smarty Suki, grumpy Bog, helpful Rae, and quiet Hedgewick. Children will relate to this cast of characters, and when the trip is complete, and the last pages of the book are read, children will understand that the camping adventure was also about courage, lessons in life, and how teasing can be hurtful. The message lends easily to opportunities for discussions about teasing, courage, teamwork, and learning from mistakes, etc. The text is refreshing, uncomplicated and the perfect font for an early chapter book. The complementing illustrations are vibrant, delightful, and inviting…. Timo Goes Camping is a great book for beginning campers and readers who enjoy the outdoors. The story has lots of information and ideas for preparing for a camping trip. Certainly an enchanting story depicting a familiar Canadian adventure! “It’s wonderful to see a new Timo story from Victoria Allenby and illustrated by Dean Griffiths. This early reader series tugs at my heart with each new story as the rabbit Timo learns new life lessons alongside his friends Bogs, Hedgewick, Rae and Suki…. This lovely series of early readers returns an innocence and humility to children’s early readers that we haven’t seen since Peter Rabbit and Frog and Toad. There are valuable lessons about friendship and self-acceptance and learning. But, even more, Timo allows children to share in his learning about friendship and interacting with others, as well as the importance of reading. From his first book, Timo’s Garden (2015), and his second, Timo’s Party (2016), the rabbit is learning how to deal with friends and his own insecurities which he is always able to put aside when he takes the opportunities to learn and gain insight from his experiences. 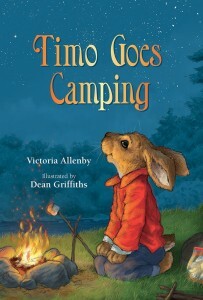 As in all three of the Timo books, Victoria Allenby has made her characters so distinct that their roles in this camping adventure make perfect sense….For an author to create a story rich in characters, atmosphere, plot and positive messages is an astounding achievement for any book but extraordinary for an early reader. The story is brought to visual life by Dean Griffiths’ artwork, with its textural richness of setting and scene. Dean Griffiths…knows how to adapt his style for an early reader, balancing the story, not becoming the story as it may, and rightly so, in picture books. What did you like about the book? …This is an excellent choice to display teamwork, to learn about camping and canoeing and having fun….A simple, short story perfect for beginning chapter book readers. There are bright, detailed digitally created illustrations on every page. “This delightful chapter book is due to be released in March 2018, plenty of time before camping season here in Canada kicks in…. When the trip begins, Timo immediately finds his knowledge useful, helping tie the frying pan to Hedgewick’s pack with the knots he learned about. As the trip progresses, Timo’s knowledge continues to come in handy. There is much teasing from Suki about the mistakes made along the way, and even about Timo’s book-learning until Timo gathers the courage to discuss how teasing can hurt people’s feelings. I liked the opportunity taken for this discussion and the way it came up naturally through the plot. I liked the topic of a typical Canadian pastime such as camping. Of course, the thing I loved most about this book was how even Suki agreed by the end that every adventure needs a librarian.